One of the most annoying errors you will receive while working in Windows is the message that for some reason you cannot delete a file. Usually something like “Cannot delete files: Access is denied” or “The file you’re trying to modify is being used by Windows or other application” will pop up on screen. Quite often the reason why this error message has appeared isn’t immediately obvious because you haven’t got any programs running that you think might interfere with the file concerned. Files become locked because they are still being used by a Windows process or service and cannot be touched until Windows releases the file. One of the worst programs to actually cause this problem is the Explorer.exe process itself getting a lock on a file or even external devices like USB flash drives so you are unable to safely remove them. Other things like malicious software, security software or crashed programs can sometimes be to blame and can stop a file being deleted or moved. Here’s a selection of 7 different file unlocking and deleting tools for you to remove your difficult to get rid of files and folders. Software such as anti-virus files are difficult to delete simply because the software tries to protect itself from malicious processes and therefore makes its files very hard to tamper with by setting advanced permissions. Knowing this, we’re going to perform a very simple test of trying to delete an avast! antivirus file called “avast5.ini” using Windows 7 x64 while the program itself is still running. 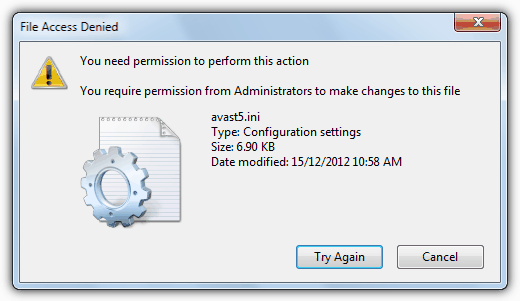 Try to delete this file normally and you will get a “You require permission from Administrators to make changes to this file” even if you’re the administrator. Most of you will know FileASSASSIN’s makers Malwarebytes from their excellent Anti-Malware program and that tool actually includes a version of FileASSASSIN, accessible from the More Tools tab. It can attempt to unlock the files handles, unload modules, kill the related process and also optionally delete the file using the built in unlocking method. There is also the option to mark the file for delete on reboot or run a Standard delete. 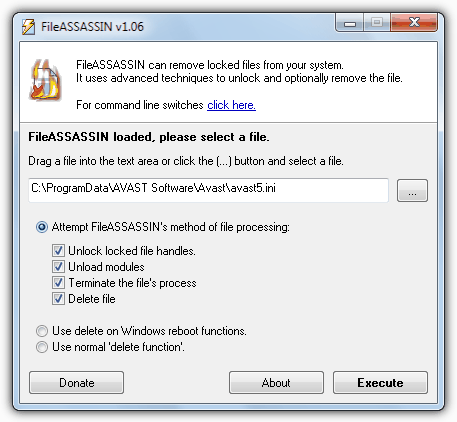 FileASSASSIN is available either as a portable or setup installer version and you simply run the program and browse for, or drag and drop a file on to the window. Then select the unlock and delete option tick boxes and click Execute. The standalone FileASSASSIN program hasn’t been updated since 2007 and may not be as effective as other tools these days, the version integrated into Anti-malware seems to be better. Works on windows XP and above. Deleting avast5.ini result: The file remained using all internal and the after a reboot options. It WAS removed after a reboot by using the FileASSASSIN function from Malwarebytes Anti-malware. 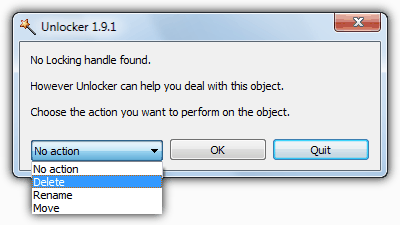 LockHunter is made by Crystal Rich, the same people behind the superb USB Safely Remove utility. It’s simple to use and shows you which processes are locking the files or folders you want to delete and gives the options to simply unlock and additionally rename or copy as well. LockHunter also has a fallback in case you make a mistake by sending any deleted files to the Recycle Bin for easy recovery. The program needs installing and can be accessed via the right click menu, which will show an entry of “What is locking this file?” or “What is locking this folder?” depending on what’s selected. Processes with a lock will show in the window and you can select the Unlock It! or Delete It! options or the rename and copy options from Other. LockHunter is still in beta so might not be totally stable, there are 32-bit and 64-bit versions available. Works on Windows 2000 and above. 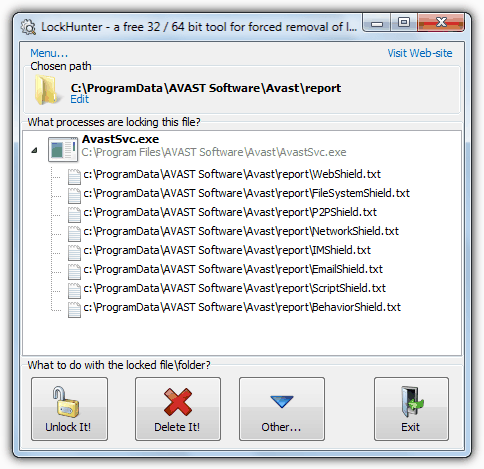 Deleting avast5.ini result: LockHunter was unable to delete the ini file, there is no delete on reboot option. IObit are the people behind popular tools like Advanced SystemCare or Smart Defrag and Unlocker is another one of their simple to use applications. The program is able to just unlock files or folders for manual file management, or unlock and delete, rename, move or copy automatically. There is also a Forced mode tick box option which will terminate all related processes if the standard mode fails. IObit Unlocker requires installing and you have to be aware of the toolbar and other adware that gets offered during the install. 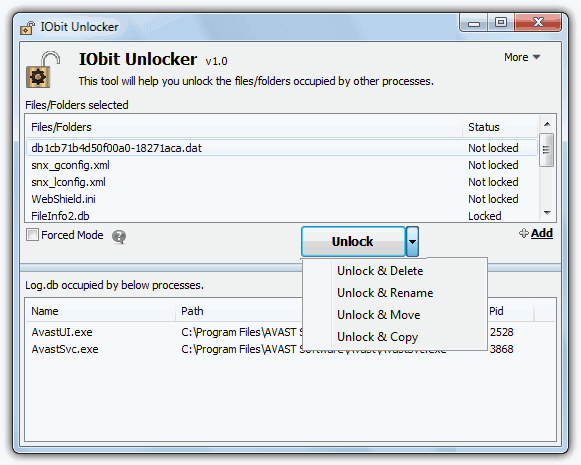 The program works best by way of the right click context menu where you simply select your files or folders and choose the IObit Unlocker entry. What you have chosen will show in the top window and clicking on anything with a status of Locked will show the processes with a lock on it below. To delete a file simply choose the Unlock and Delete option from the central drop down button. IObit Unlocker works on windows XP and above. Sadly the official download from IObit redirects to FreeNew.net where they force you to download an install manager to get the program. The CNET download link DOESN’T have an install manager, or you can just use Downloadcrew’s download link. Deleting avast5.ini result: The file was successfully deleted WITHOUT needing a reboot or using Forced mode! What’s more, IObit was able to easily delete the whole folder full of these protected files, where most tools here couldn’t even delete just the single file. Anti malware and Firewall developers Emsisoft have created BlitzBlank to help in the removal of difficult to delete files especially in the case of malicious files and processes. The program is specifically designed to remove files during the Windows boot process before most software has a chance to protect or lock a file. The tool has other deleting options besides files and folders, such as removing registry entries, disabling drivers and also executing other files. 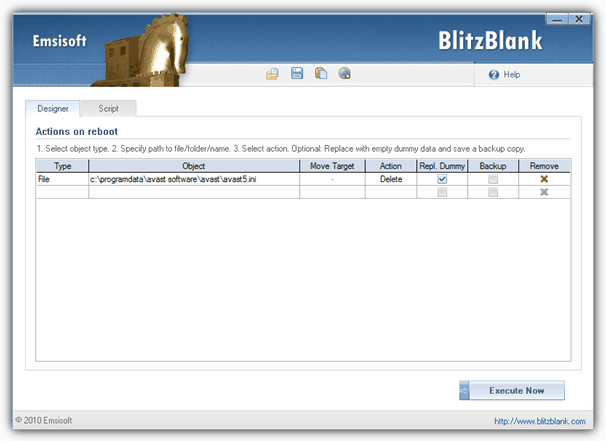 BlitzBlank is a tool for more advanced users and a warning on starting the tool will tell you that. BlitzBlank is a portable executable which makes it great for the USB toolkit. To delete a file make sure you’re on the Designer tab, click in the Type column and select File or Folder from the drop down, click on <File Path> in the Object column and either type in or browse for the file or folder using the “…” button. The Action column will allow for deleting, moving or copying and you can replace with a Dummy or choose to make a backup. Multiple entries can be added, just enter the new item on the next line. Click Execute Now and the program will prompt to reboot. All actions in the Designer tab are fed into the Script tab where they can be edited, saved, loaded or pasted in from a previous session. BlitzBlank is compatible with Windows XP to Windows 8 32-bit and 64-bit and is also part of Emsisoft’s Emergency Kit which is a valuable, free and portable malware removal suite. 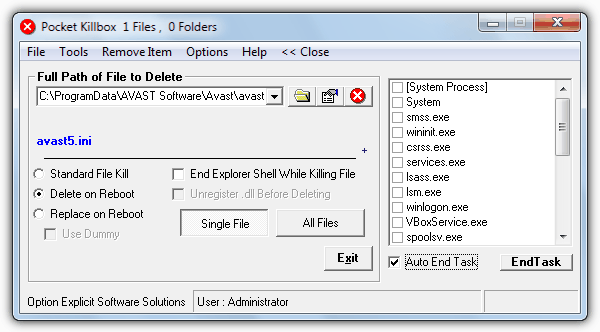 Deleting avast5.ini result: The file was successfully deleted after a reboot. Unlocker is without doubt the most popular locked file removal utility around and has been for quite a few years. In addition to helping remove files with permission or file protection issues, it also tries to remove the process handles that might have a lock on a file causing it to be not removable. Or failing that, you’re given the opportunity to kill the process identified as being the cause of the lock which hopefully allows for deletion. An install will give you a handy right click context menu entry where you can simply right click on a file or folder and select Unlocker from the menu. Depending on if there are any locking handles on the file will determine whether you get the simple delete helper dialog above, or the main window which shows the processes causing an issue and you have the option of unlocking the handles on the file or killing the process causing the lock completely. The program comes in both 32-bit and 64-bit versions and also a portable version although currently it is one release behind the setup installer. Something you need to watch out for is the adware options that need to be disabled during an install. Deleting avast5.ini result: The file remained intact using rename, delete or move, even after a reboot. 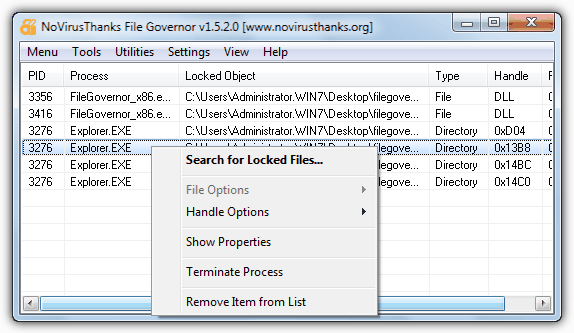 NoVirusThanks File Governor works in quite a similar way to Unlocker in that it can try to forcefully delete a file as well as unlocking the handles attached to it including DLL file handles. If unlocking the handles doesn’t work, you can terminate the process causing the problem as long as it isn’t a system critical process which is why some knowledge is required of which processes are safe to kill and which aren’t when using these tools. File Governor comes as both portable or setup versions and the handy thing is the portable version still gives you the option to include a right click entry for it in your Windows context menu. Use that right click option or open the program and use “Search for locked files” for the program to analyze your file. Any processes with a lock on the file will show in the window where you can choose to Unlock the handles or terminate / delete / copy / move the process. The Tools menu gives the option to browse for and Force delete, Delete on reboot or Rename a single file. File Governor work on Windows 2000 and above. Deleting avast5.ini result: Force delete, Delete on reboot and Rename all failed to remove the file. KillBox is a tiny single executable of under 100K and sadly the program has been abandoned with no website and no chance of updates or fixes. It does pack quite a lot into that small size though, and offers a standard file delete method, a Delete on reboot and also replace the with a dummy or chosen file on reboot method. Another neat little option is a pop out task killer (by pressing Processes >> in the menu bar) which can auto kill tasks every 5 seconds and a few useful tools such as a handy little temp file cleaner and quick access to the HOSTS file, the registry editor and services. You can browse for or drag and drop more than 1 file onto the window at once, dropping a folder will enter the files in the folder and the directory itself at the bottom of the drop down list. Choose the delete method and then click the red icon to begin the delete process. Works on Windows XP to Windows 7. Deleting avast5.ini result: Using Standard, Delete on reboot or Replace on reboot failed to remove the file. Editor’s Note: Some other tools we looked at were EMCO’s UnLock IT / MoveOnBoot and UnlockMe. Although Unlock IT is a pretty looking program with themes, it can only unlock process handles and cannot delete, move or rename files directly. MoveOnBoot is designed to delete or move files during a reboot but didn’t touch the test file, and has a massive 35MB installer!! UnlockMe looks like a useful tool but crashed nearly every time we tried to select a file to delete. Also looked at were Delete Doctor and FilExile and both are more like general delete tools without the more advanced options needed to delete stubborn files. We were very impressed by IObit Unlocker because it was the only tool to delete the test file (and its whole folder) without needing a reboot while BlitzBlank and the Malwarebytes version of FileASSASSIN did the job after a reboot. If you’re using a tool such as Unlocker and come across something you can’t remove, those other programs are worth a look. Was looking for a solution for a whole day, and now I use IObit. Thankyou for sharing this information! What is the reason why Windows XP locks directories? For example, start Calc or Notepad from a folder, then that folder won’t be deletable until the program is closed or I browse to another folder from within the program. This is an old problem, but still gets annoying. I understand that files need to be locked so that a program can finish working on them, but why directories? The expected result is that the program drops me into a default My Documents if it can’t find the previous directory. It makes perfect sense if you think about it. Trying to delete the folder containing the executable you are running is the same as trying to delete the running executable itself. Great article. Thanks for posting. IOBit unlocker worked for me. lockhunter is good but which one is best? Unlocker no longer has context menu working as used to. Is there alternative unlocker with context menu so I can unclock file straight away. Unlocker still has a context menu and it works in Windows XP, Vista, 7, 8, 8.1 and 10 (including Anniversary update). I was using Unlocker but it started to get flakey when I started using Windows 7 and now Windows 10. I then started to use IOBit Unlocker and I never looked back since. I’ve been using Unlocker on Windows 7 for many years and also Windows 10 for the last year, works fine on both. The IObit tool can delete more stubborn files though. What if the files are IObit that have attached themselves to explorer.exe? Ive had a few very persistent malwares which despite running av’s , mbytes and various other security programs and uninstalling the malicious files/programs, they have reinstalled themselves every reboot. In each case I was finally able to get rid of start up malware files using WinPatrol freeware by highlighting the files in its startup screen tab & right clicking to use option ” delete file on reboot” – its never failed me. Winpatrol also many other useful functions . LockHunter did not work for me. I rebooted as instructed and got a system message telling me LockHunter was trying to delete the folders I’d selected but that it could not delete the folder. I’ll try another program but starting to lose hope this can be done at all…. Try using the third tool (IObit Unlocker) that was listed in this article. Just downloaded Unlocker and it is infected with malware. The link takes me to the the EmptyLoop website and when I tried to download the file, the file is downloaded from emptyloop. The installation then attempted to install BoBrowser which I declined, but it installed it anyway. It also install startsearch which appeared to be made by someone in China and when I tried to delete the files, HPUi, load64 etc, it keeps coming back until I ended the process tree. AVOID (though the unlocker application itself appeared to be ok – so far). Emptyloop is the official page for Unlocker, it’s not really malware as opposed to adware which has always been in the Unlocker installer. If you disable and skip the options they won’t be installed. Even downloading Unlocker from other sites like Softpedia will still include adware in the installer. use lock hunter to find which process is locking your file or folder, go to task manger, end that task and now the file or folder has been unlocked, you can delete easily. After trying Unlocker, finally FileASSASSIN is the best tool to remove any corrupted file. Now Unlocker is become my alternative tool. Thanks for sharing wonderful piece of information. Another alternative is “LongPathTool” tried and tested.Guaranteed fix. Here you can rename, delete, open and move your files instantly without the worries of error messages saying that there is some sort of a problem. Thanks! a lot Sir and all others. I was using unlocker and it wasn’t working well in win-7 for don’t know some reason (may be as it was not meant for win-7). Sadly LockHunter DOES work. I don’t know what others real issues are but I’m able to unlock all the files I’ve tried that were locked with little problems. I’ve tried several other programs that use to work when using XP but just won’t work with 7 even when they say they will. One of the few that worked in Win7. But I have a request to make! Command Line!!! I need to unlock some files in a .bat script and command line is needed! WoW!!! I really like Unlocker and I was hoping for an update. I’ll have to check out LockHunter. Thanks for the alternative review. Thanks Raymond. Now if there were just a x64 equivalent of Sandboxie I’d make the switch to an x64 OS. Great program. I found this a few months ago when I upgraded RAM and went to x64. Haven’t tried it on Windows 7 x64 yet though. I found out this a few weeks ago when I switched to XP x64 as I was in need for an Unlocking Tools…. thanks a lot Mr. Ray. Thanks, I’ll have a look, I never liked Unlocker. Not sure where I got it, but have a look at EjectUSB by William Hedrick. Also look inside the readme file under section “External Utility Support” and you’ll find similar eject utilities.